The new Adrenaline Rush Extreme is a winding 1,850 square foot dual lane maze of adrenaline-inducing activities! 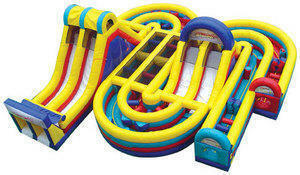 This inflatable obstacle course offers a dual-lane climb and slide, a curved dual lane obstacle track and a double lane slide/obstacle track combo. After crawling through the pipe entrance of the Adrenaline Extreme, the kids are immediately challenged with pop outs and squeeze walls obstacles. Halfway through this course is a rock climb and slide, designed to speed kids through more challenging pop out and squeeze wall curves. The final leg takes players mammoth rock climb and speeding slide to the finish! This inflatable measures 43' L x 42' W x 16' H.